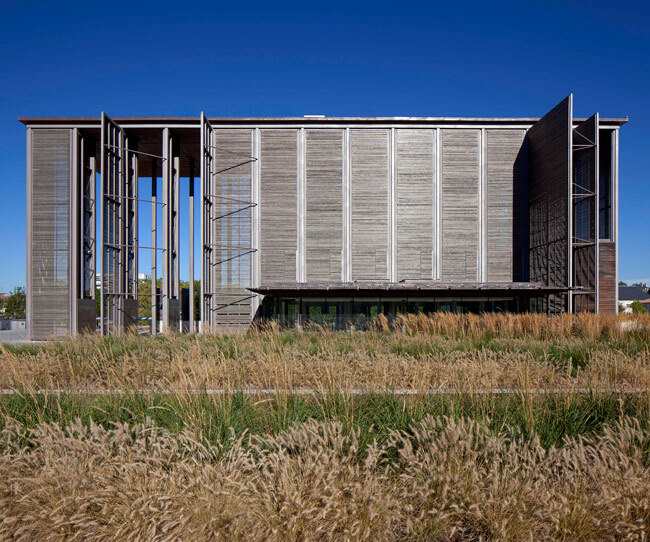 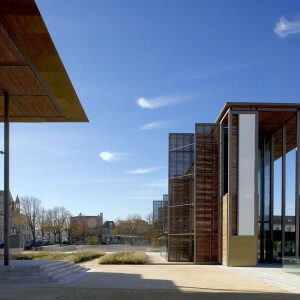 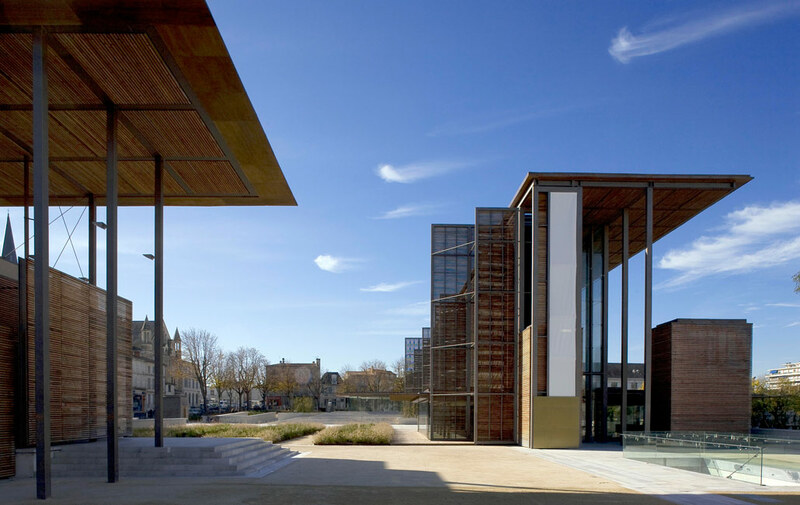 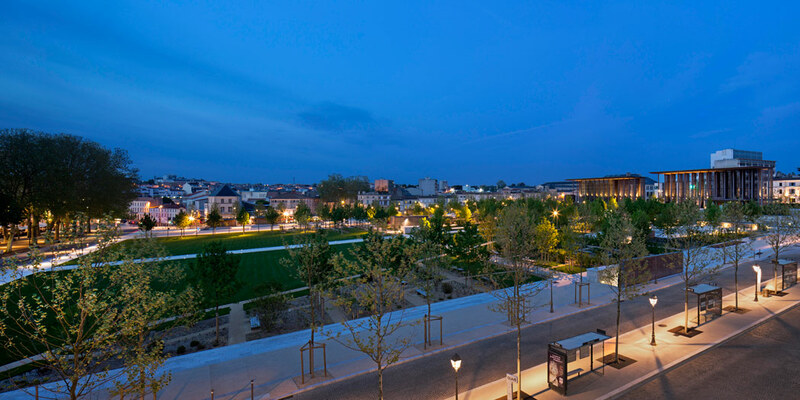 Studio Milou Architecture: The Place de la Brèche project restores an urban dimension to the former Niort fairground. 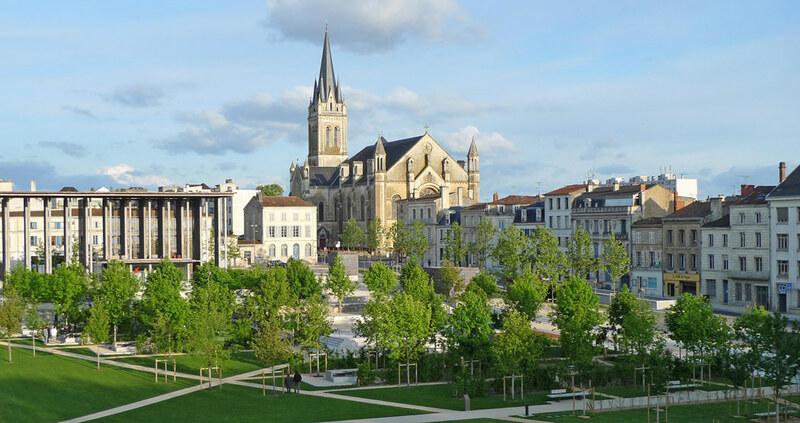 The Place de la Brèche, a former fairground was located in the wet areas next to the town’s walls at the meeting point of the roads of Paris, Limoges and La Rochelle. 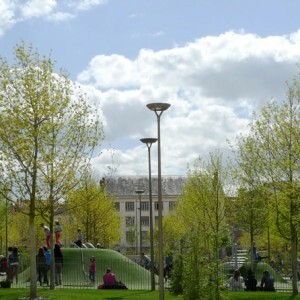 During the 19th century, urban development and extension changed the shape of the town, shifting its centre of gravity: the former fairground became the new geometrical centre of the modern town. 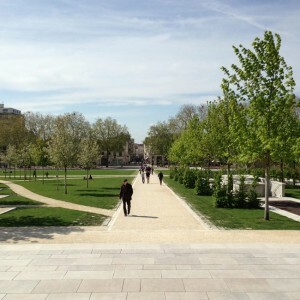 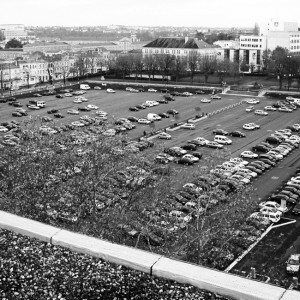 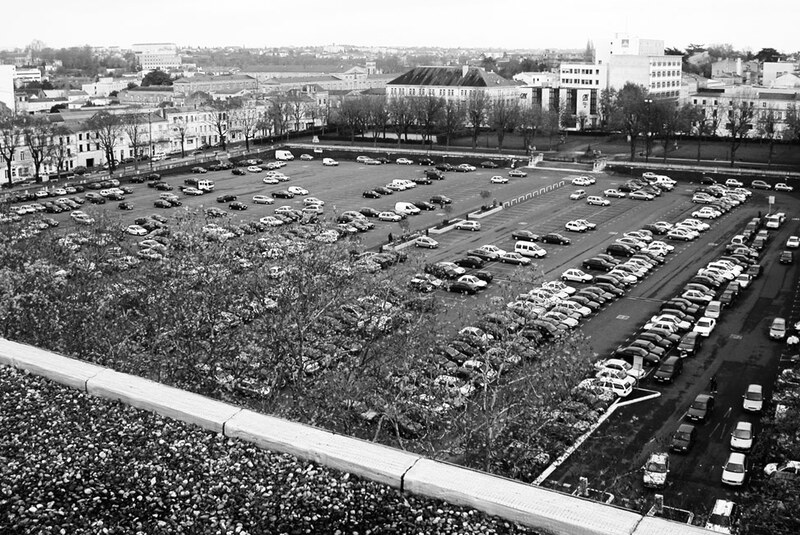 During the 20th century, this large space of 4ha,turned into a wide free open space used as a car park. 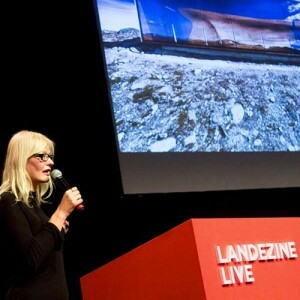 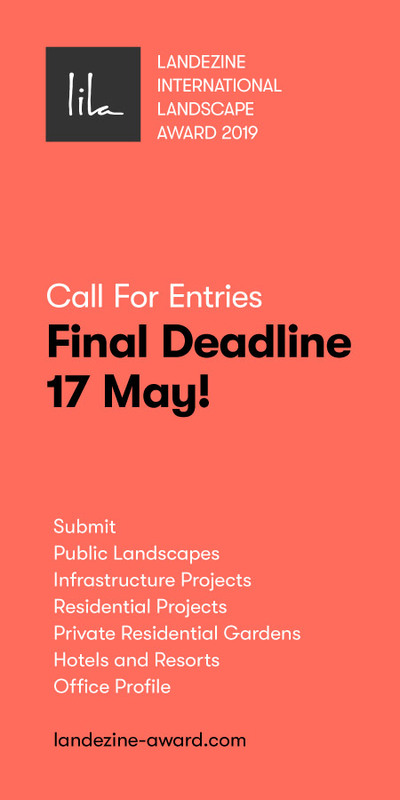 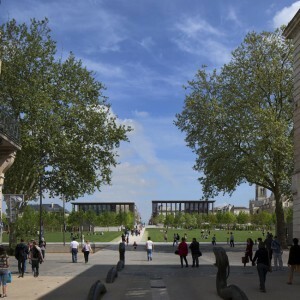 A Urban redesign was necessary and the City had to combine public consultation and architectural competition with a study definition. 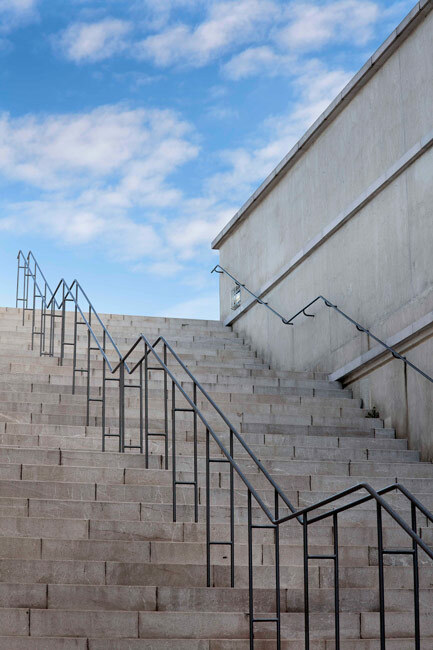 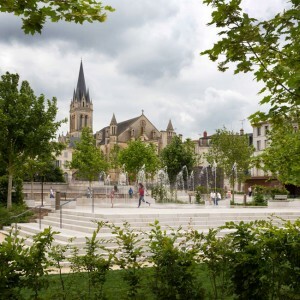 Many studies have been carried out, but none have succeeded, and it was only in 2002 that Bernard Bellec, the then mayor of Niort, launched a study for a major project to convert the square. 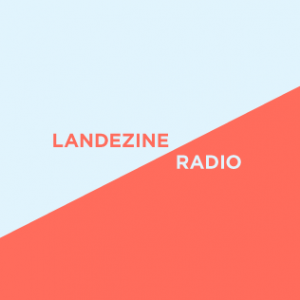 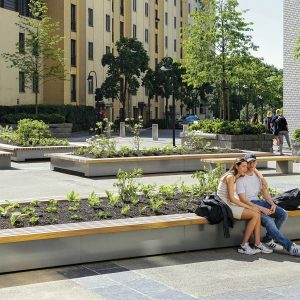 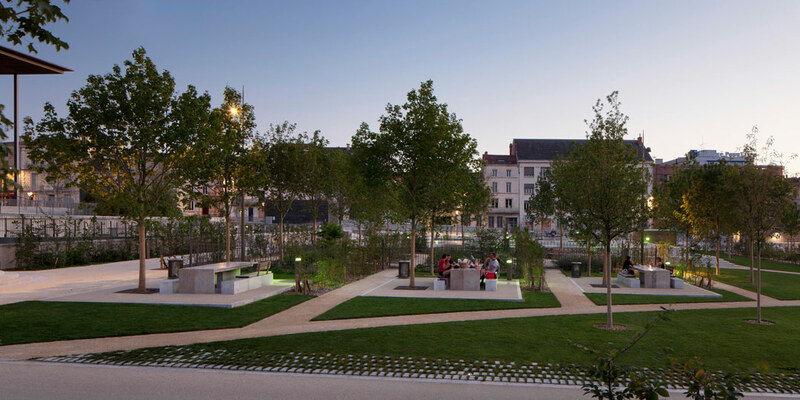 The first phase of this study, worked on by Hervé Beaudoin, Gérard Lancereau and Studio Milou Architecture, led to the formulation by the local authorities of a programme of work for the future square. 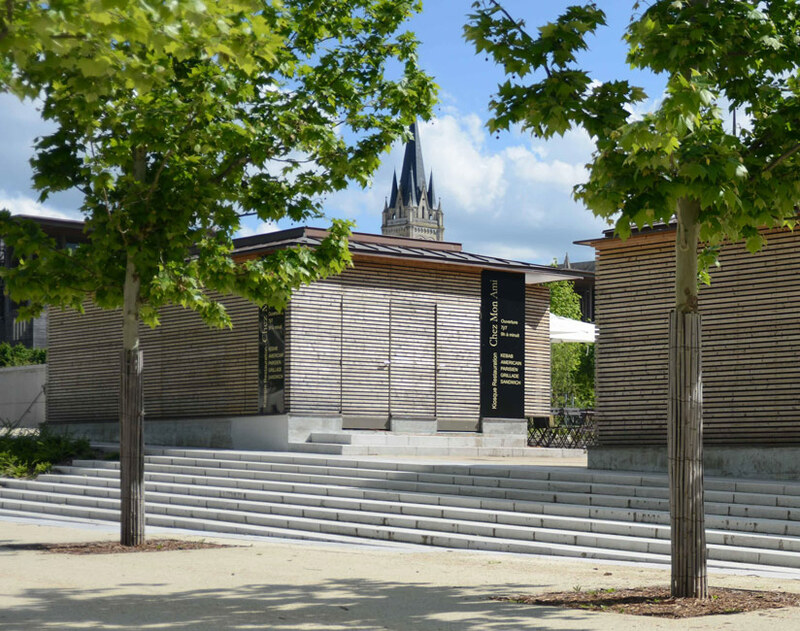 Various facilities, including cafés and restaurants. 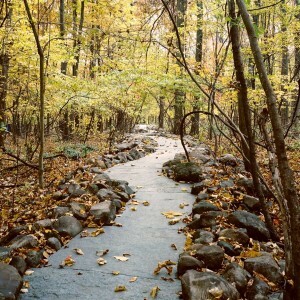 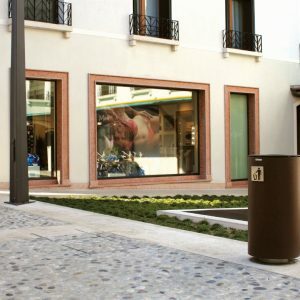 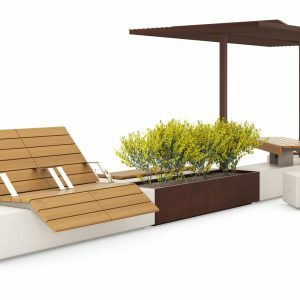 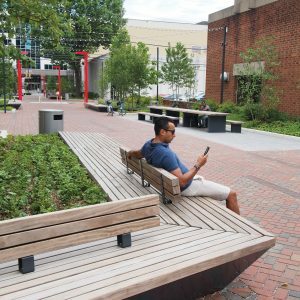 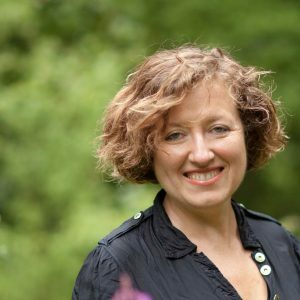 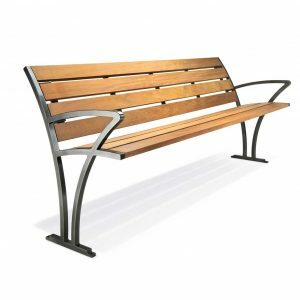 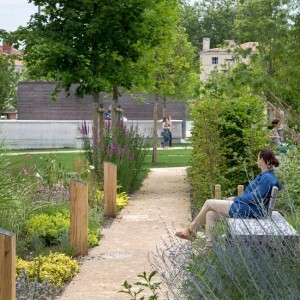 • A demand from a section of the inhabitants of the district for more calm, less noise and more green spaces, often associated with mistrust of the project underway. 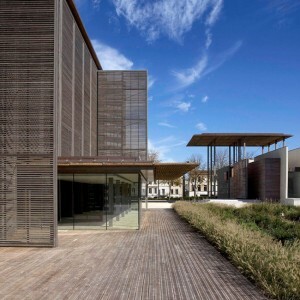 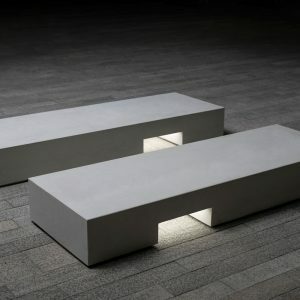 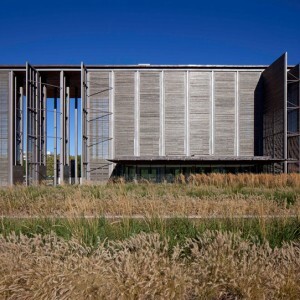 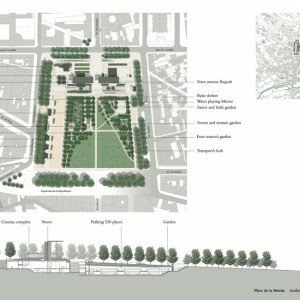 In the light of such a debate, the architect’s duty is to present a solution that can reconcile these two opposed tendencies. 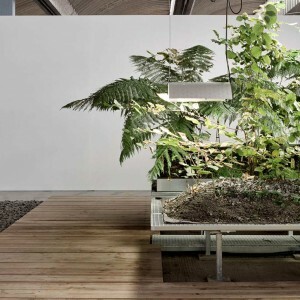 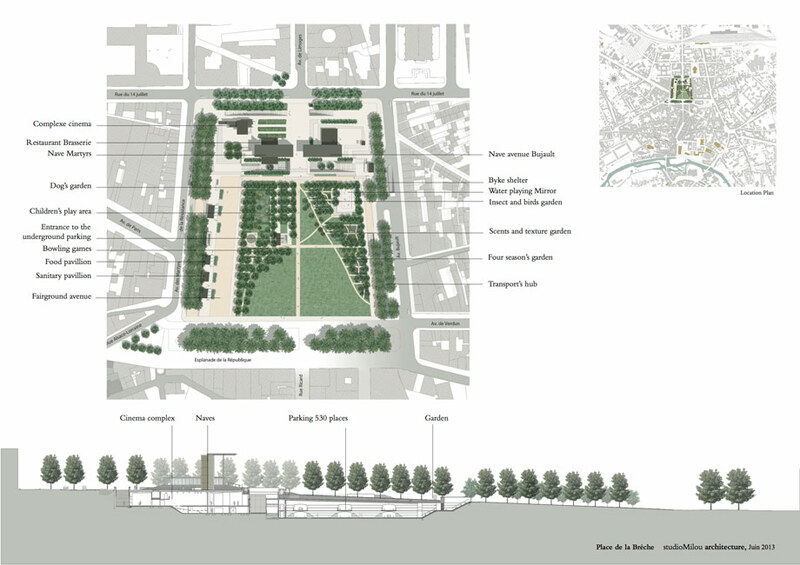 Jean-François Milou’s project proposals sought to bring together contradictory desires expressed by public opinions while at the same time minimizing the impact of constructions such as glasshouses and kiosks.The architecture was deliberately self-effacing, only making itself no- ticed at strategic points in the Place in order that the landscape could play a leading role.The network of underground elements, the underground garage and cinema, was woven together with that of the garden in the practical architectural work.This in turn allowed the various constructions to be better linked together and better continuity to be established between those constructions that were under- ground and those in the open air. 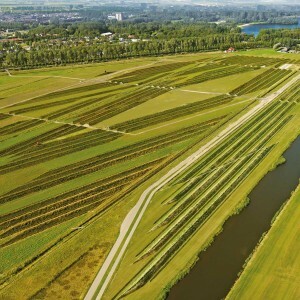 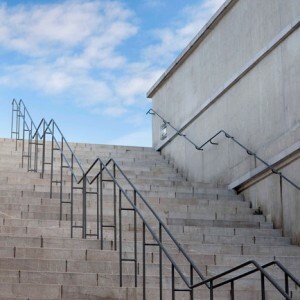 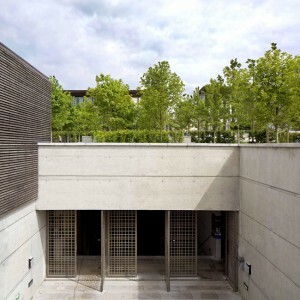 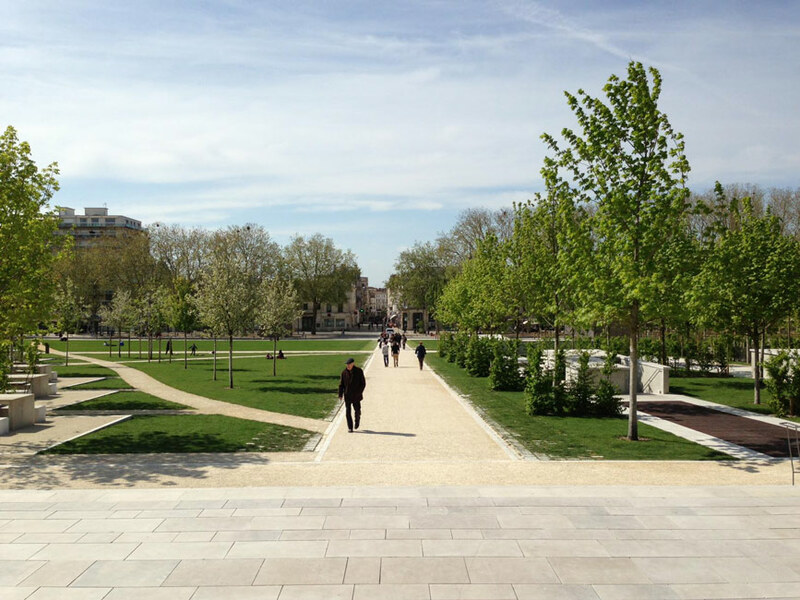 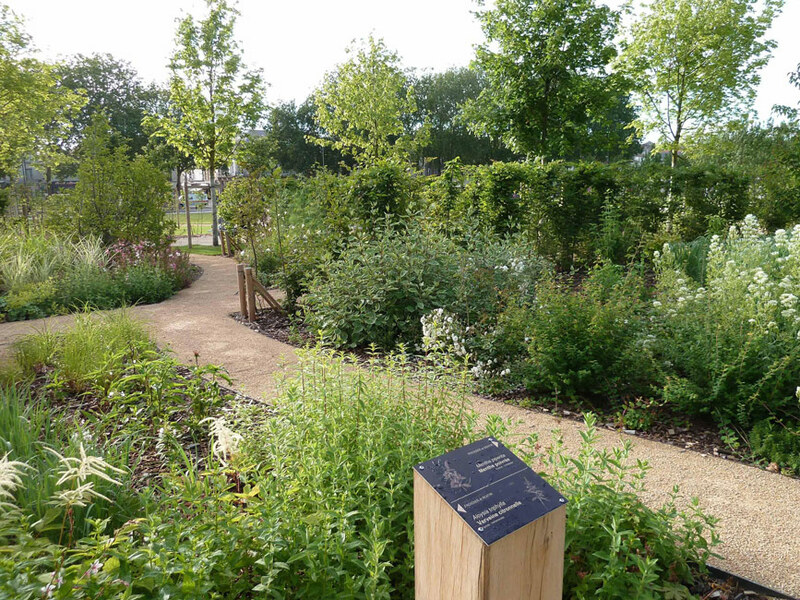 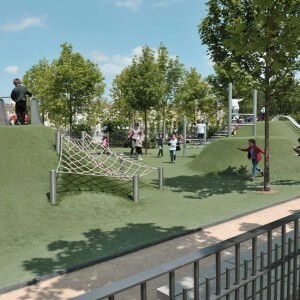 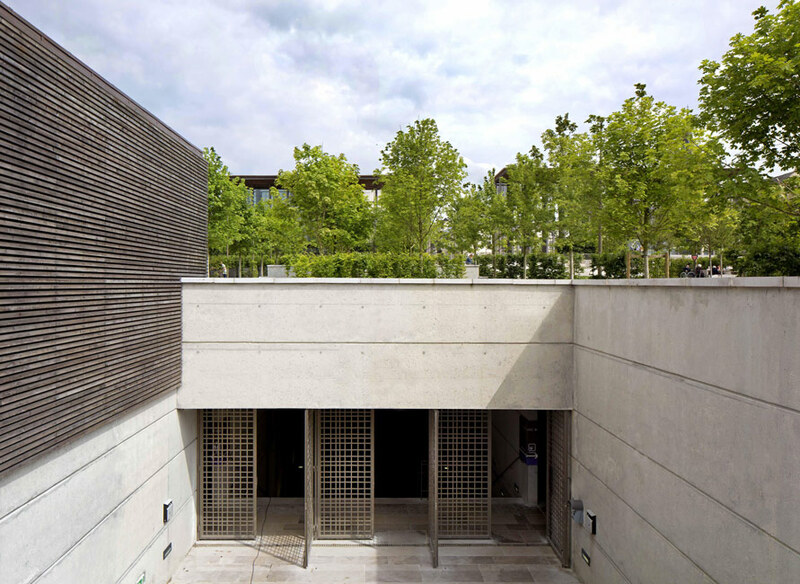 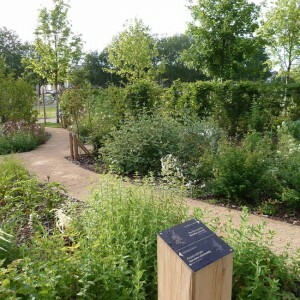 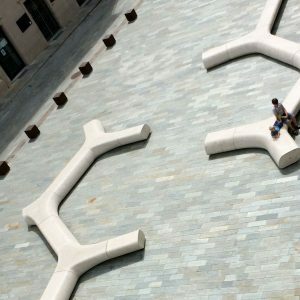 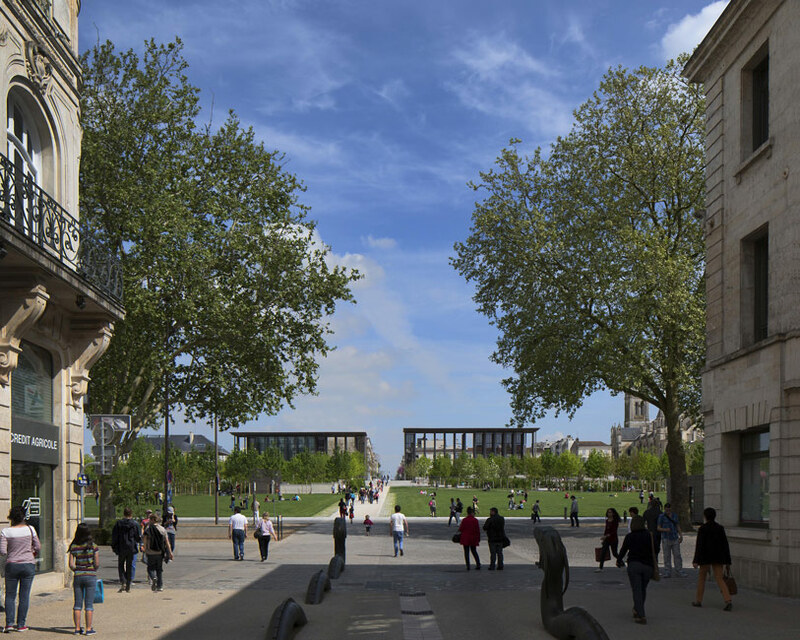 It also meant that the green spaces would be better connected with the underground infrastructure.This approach has allowed the landscape to blend naturally with the infrastructure, rendering the latter invisible and restoring the original character of the site. 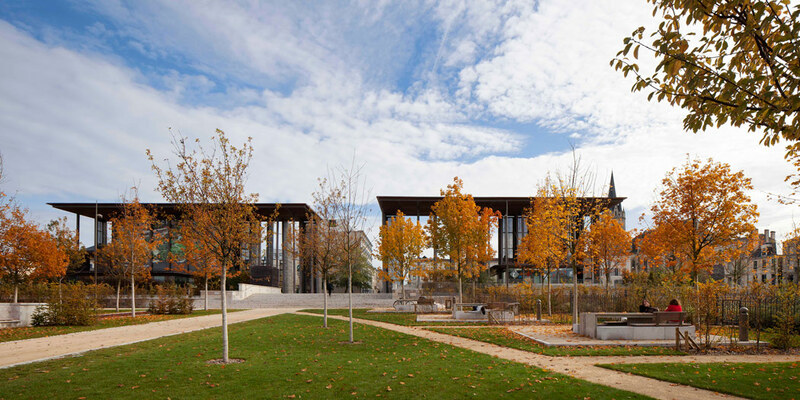 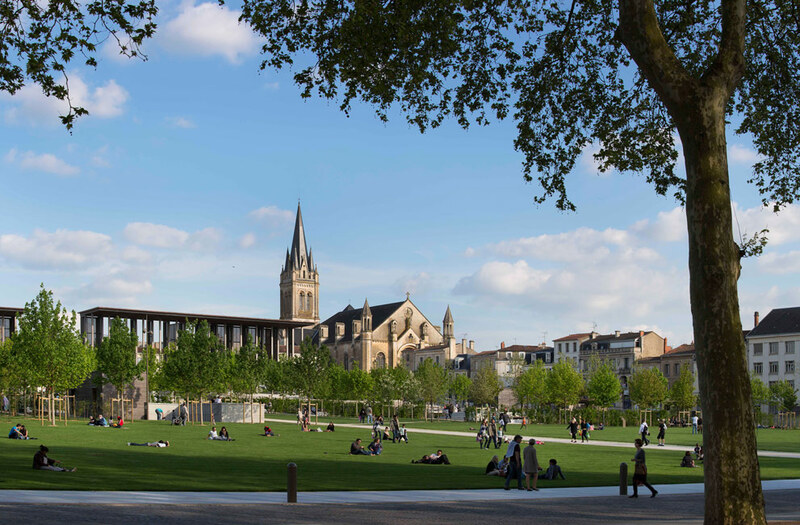 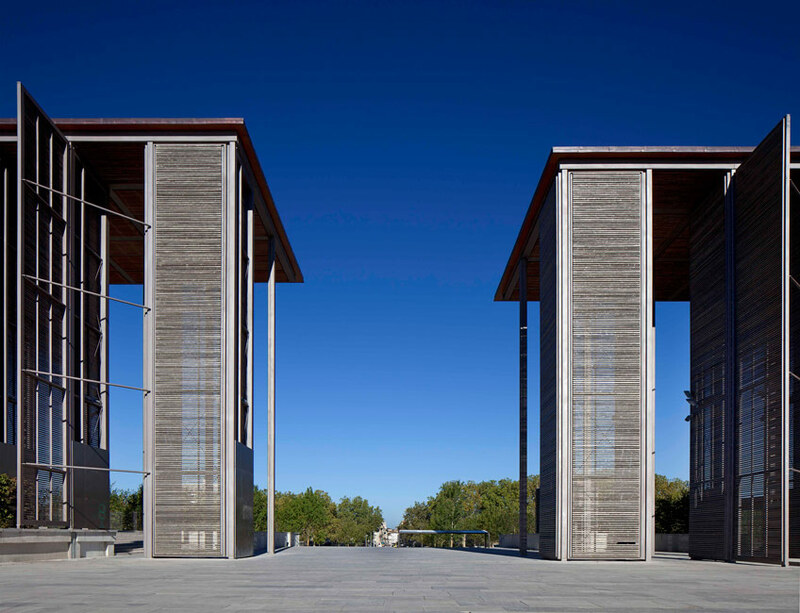 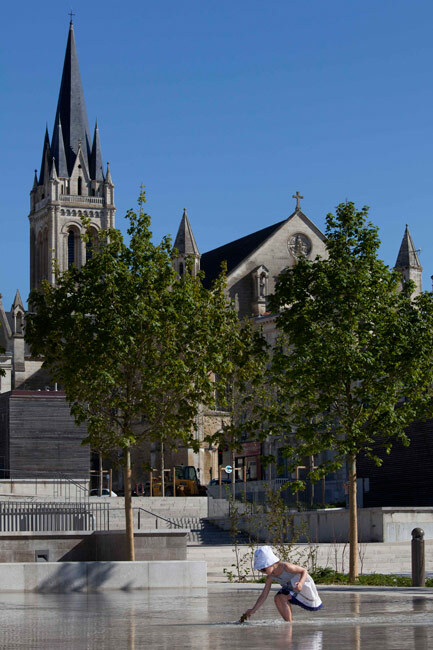 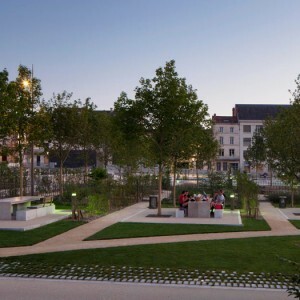 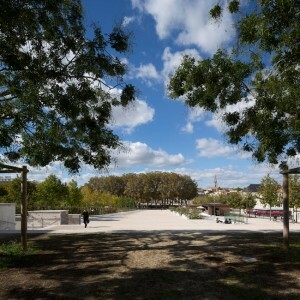 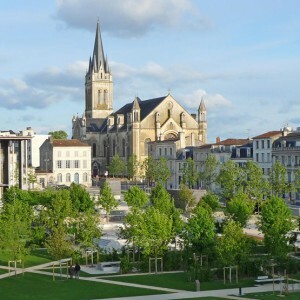 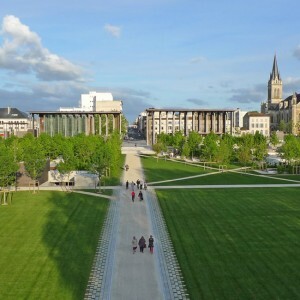 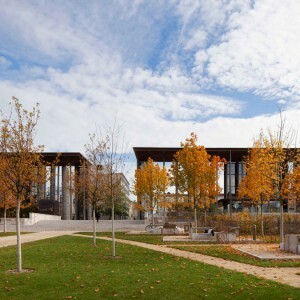 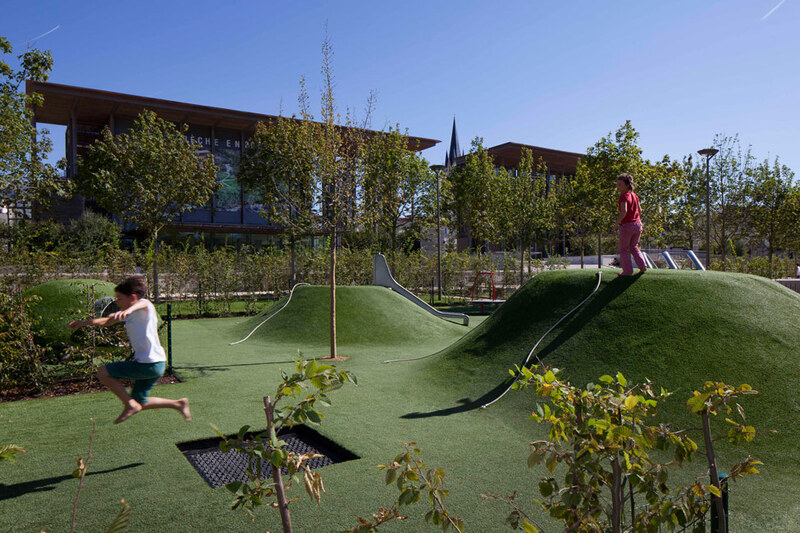 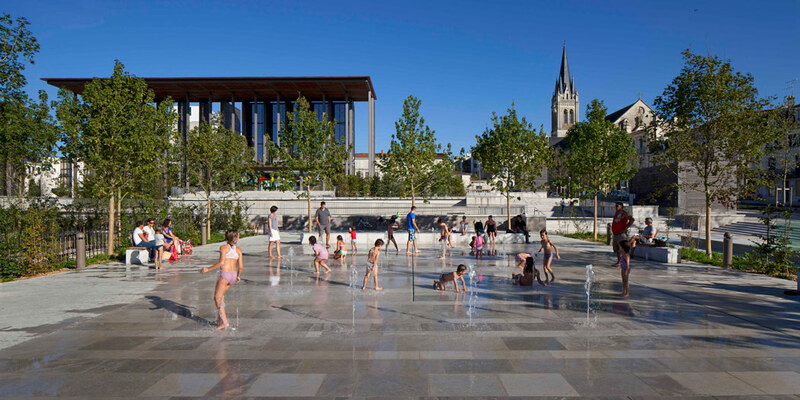 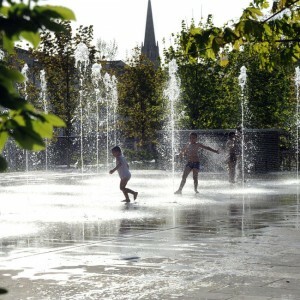 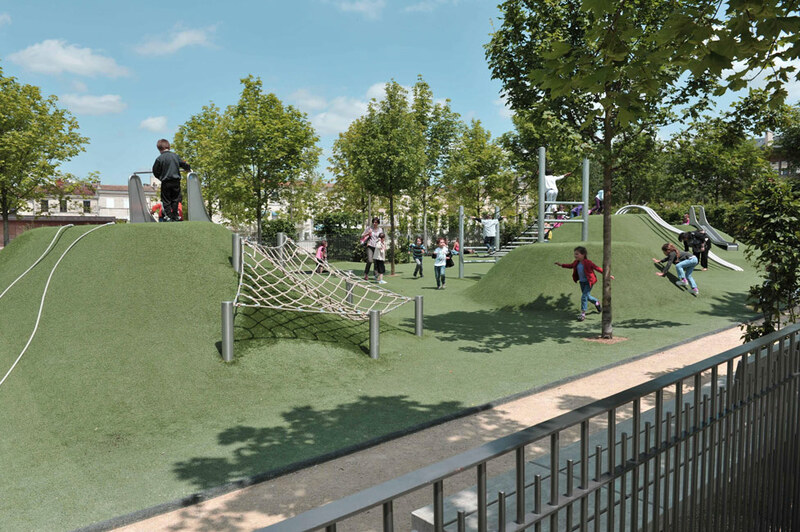 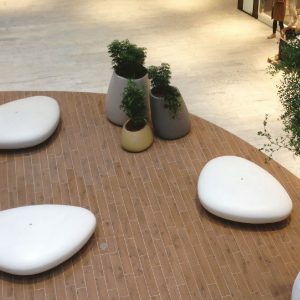 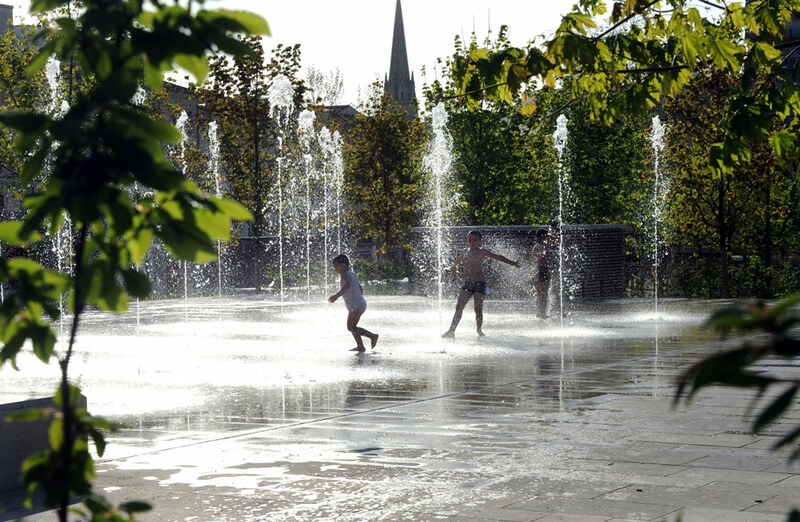 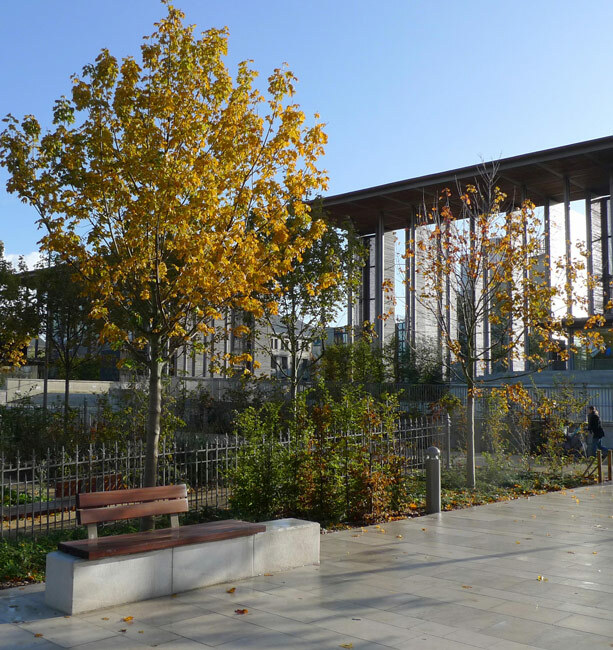 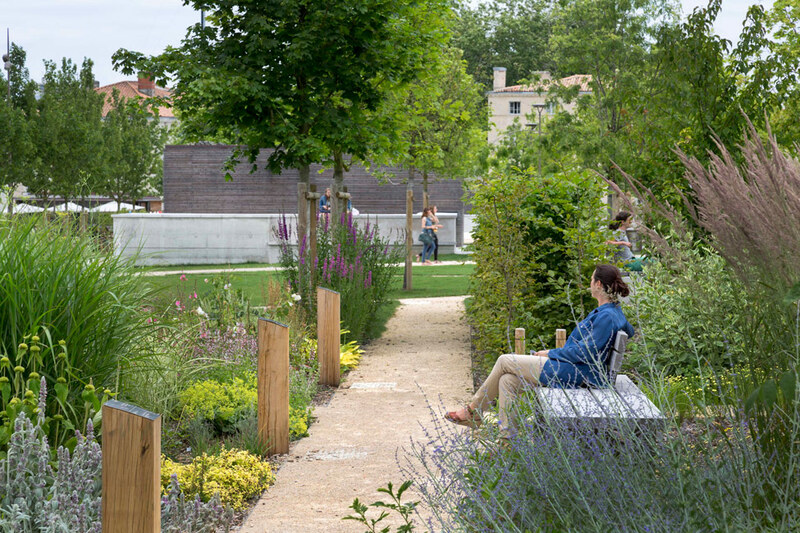 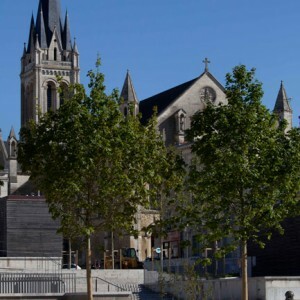 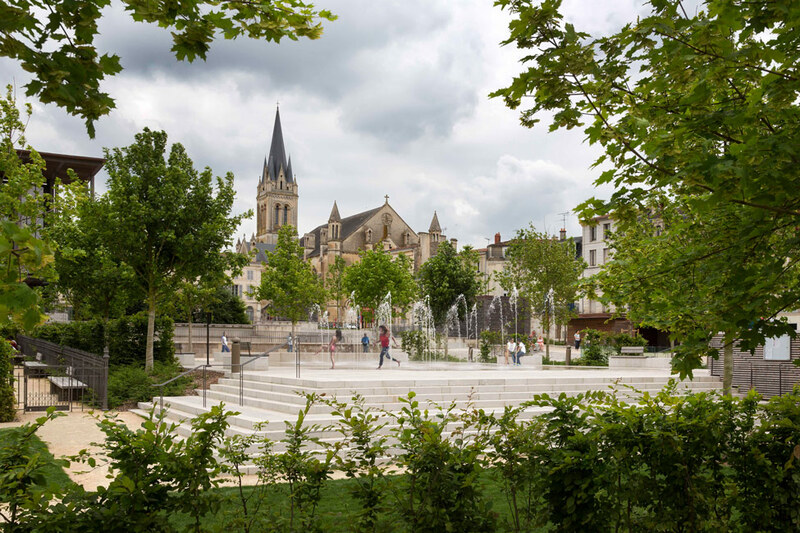 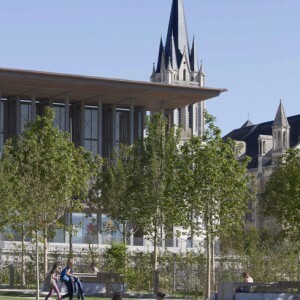 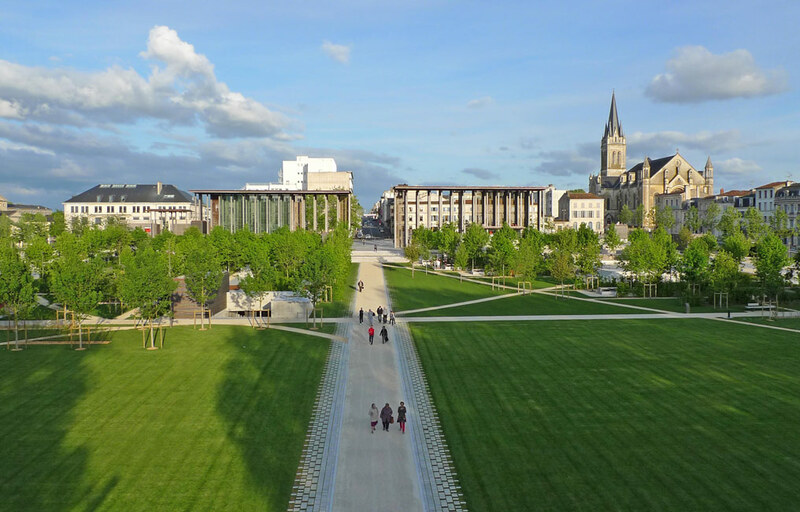 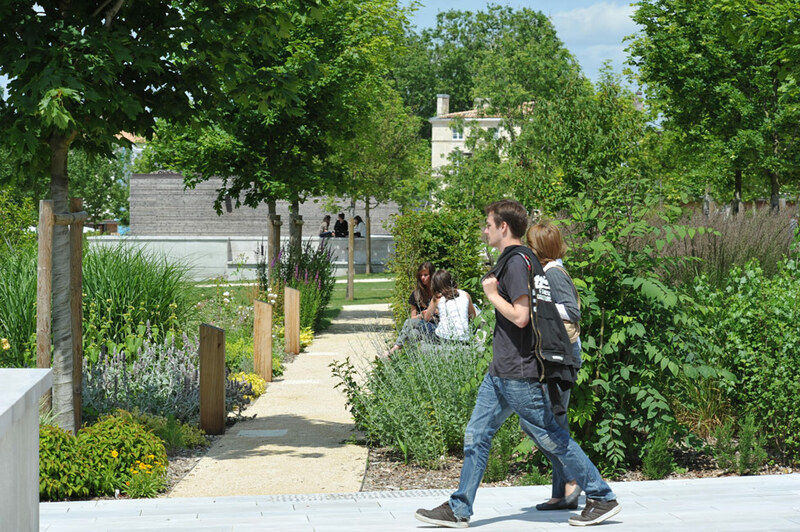 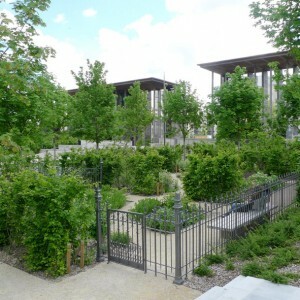 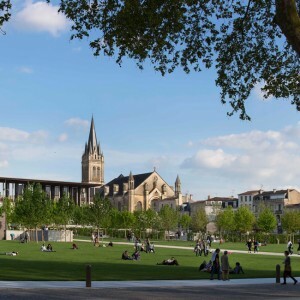 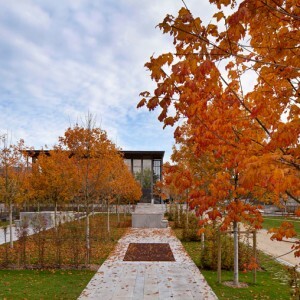 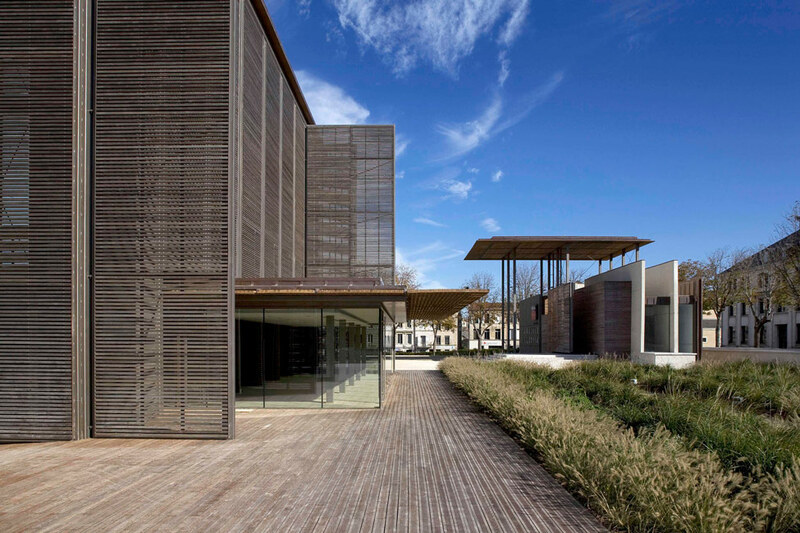 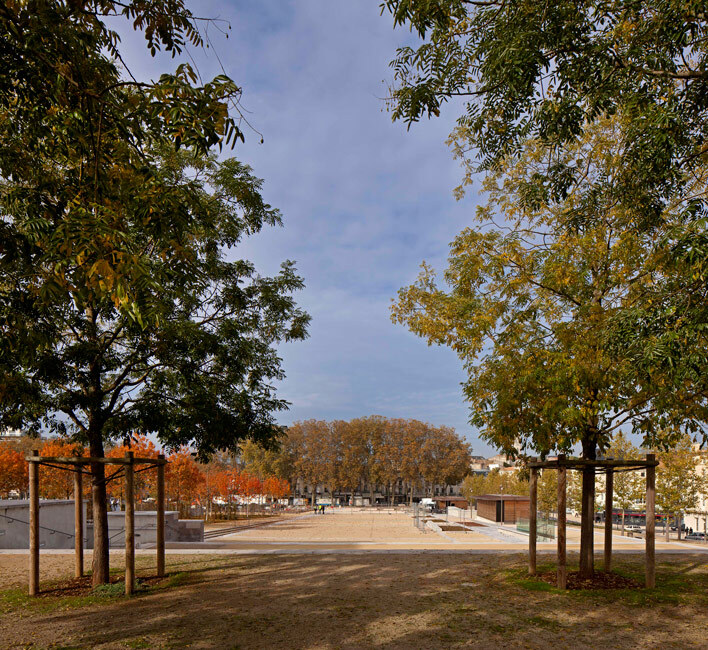 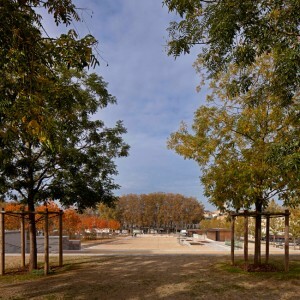 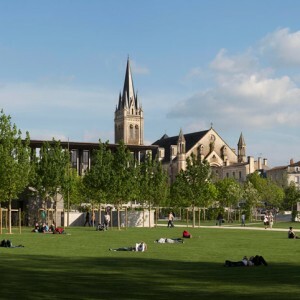 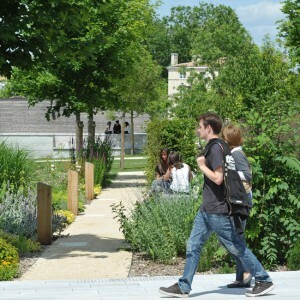 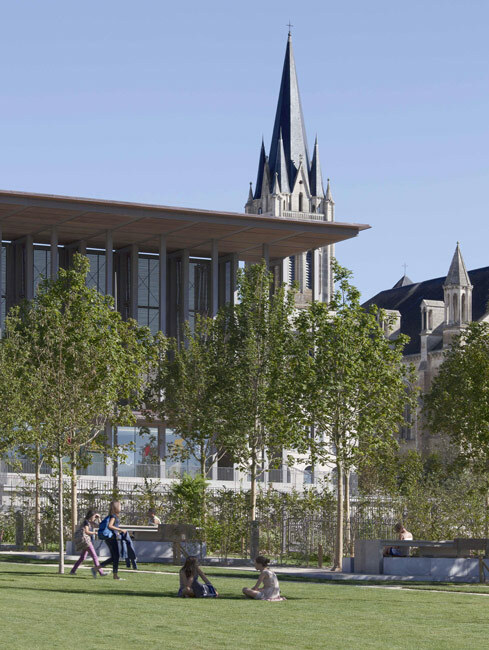 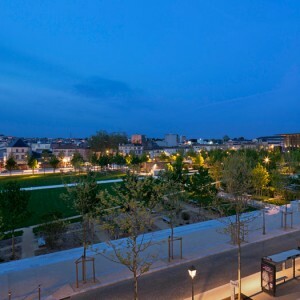 StudioMilou viewed the Place de la Breche as an opportunity to breathe new life into the centre of Niort, to attract its inhabitants and surrounding communities towards the Breche with its marriage of beautiful landscaping, entertainment, dining and practical facilities. 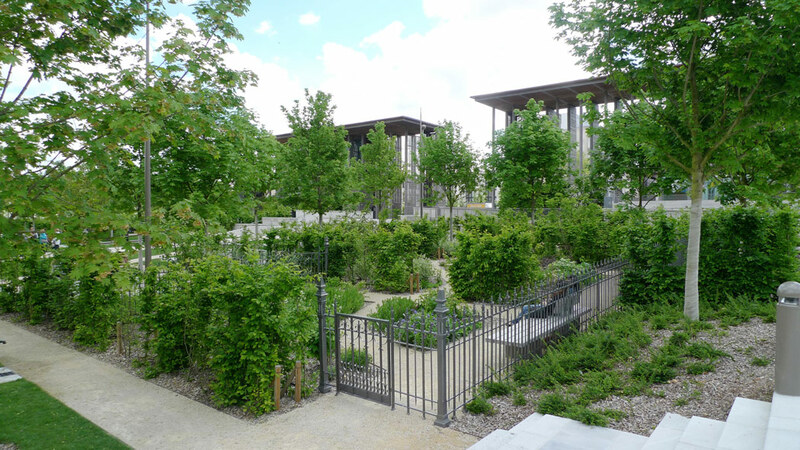 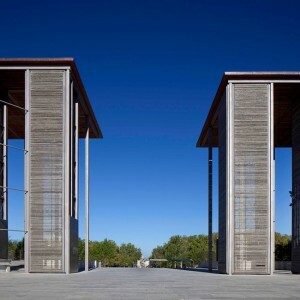 Born in Niort, and raised between the nearby town of Celles-sur-Belle and Paris, Jean-François Milou personal attachment to the town was reflected in his determination ‘to give to the city what any project in Paris would demand of the architect ; a beautiful place of the highest design by any standards’. 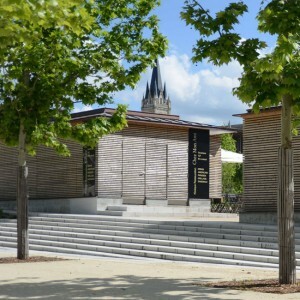 studioMilou set about working on La Brèche to give back to Niort, a historic city boasting wide avenues, elegant traditional architec- ture and a dynamic local population, including the local cafes and other businesses seeking a growing clientele, a place of elegance able to attract visitors from the region and further afield, and to compete with or surpass comparable squares worldwide.